Barska offers a wide range of special purpose monoculars from golf scopes to spyglasses to marine monoculars a with built-in compass. Barska Battalion monoculars are mid- and full-sized monocular with 32- and 42-mm objective lenses. Battalion monoculars are water-resistant and tripod adaptable. The 10-25x42 model features zoom capability. All Barska Battalion monoculars come with a wrist strap and carrying case. 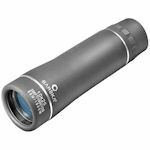 Barska Blackhawk monoculars come in 10x25 compact and 10x40 full-sized models. Featuring BaK-4 prisms, and twist-up eyecups, Blackhawk monoculars are sealed and fully waterproof and rubber armored. Blueline monoculars are a diverse group of optics including two golf scopes with intrinsic range finders and a close focus monocular intended for nature watching. The 8x22 WP golf scope features ruby-coated optics. 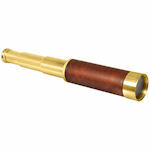 The 25x30 Spyscope is a precision crafted brass telescope with a collapsing focusing eyepiece. 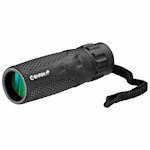 The 10x40 monocular has a large 40-mm objective and 10-foot close focus capability. 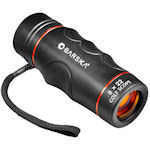 The Barska Deep Sea 7x42 monocular features a large exit pupil, built-in compass, and ranging reticle. Deep Sea monoculars are O-ring sealed and nitrogen purged to be completely waterproof, and heavy rubber armoring makes them shockproof as well. The deep Sea monocular has a design. 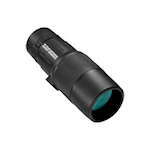 Barska Golf Scopes with an intrinsic range-finding reticle tell you the distance for that next shot. Barska Golf Scopes come in an 8x22 design featuring ruby-coated optics. 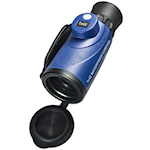 Barska Level monoculars are available in 10x42 and 8x32. They are among the larger budget monoculars. Be a Trend-setter with your monocular. Barska Trend series monoculars are contemporary, compact, lightweight and economical. 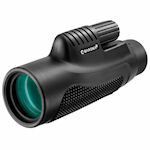 Fully-coated optics give Trend monoculars a bright image. Trend monoculars come with a neck strap and carrying case, and are backed by Barska's limited lifetime warranty.